The information presented on this page was originally released on January 15, 2009. It may not be outdated, but please search our site for more current information. If you plan to quote or reference this information in a publication, please check with the Extension specialist or author before proceeding. Flames are dancing in the fireplace and I know an arctic blast is on its way, but I am looking at photos of Cotton Candy, Wine and Cheese, and Roccoco, which sounds like a delightful chocolate. These tasty-sounding names are all new selections of verbenas. While we're stuck inside waiting for warmer weather to arrive and the rain to stop, this is a great time to plan which plants you will use this year in your landscape and mixed containers. Verbenas have always been some of my favorite flowers because they offer such wonderful color and have a long growing season. Many will return year after year with good drainage and a little rejuvenation pruning through the warm season. They also provide the sweet nectar relished by visiting butterflies. 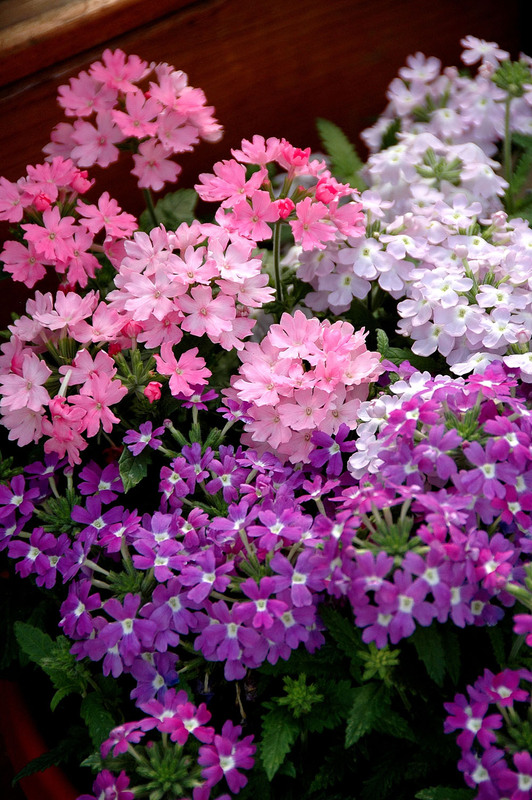 The selection of new verbena varieties, colors, mixes and even flower forms is almost as staggering as that of petunias. I don't know which ones you will find at your garden center, but when bedding plants arrive, you will be thrilled with the possibilities. Both Cotton Candy and Wine and Cheese are new mixes or blends that can stand on their own and create incredible hanging baskets or designer containers. Cotton Candy reminds me of the sugary colors you see from vendors at the fair. It is predominantly white, blue and pink. Wine and Cheese offers red, burgundy and peach in a most enticing arrangement. 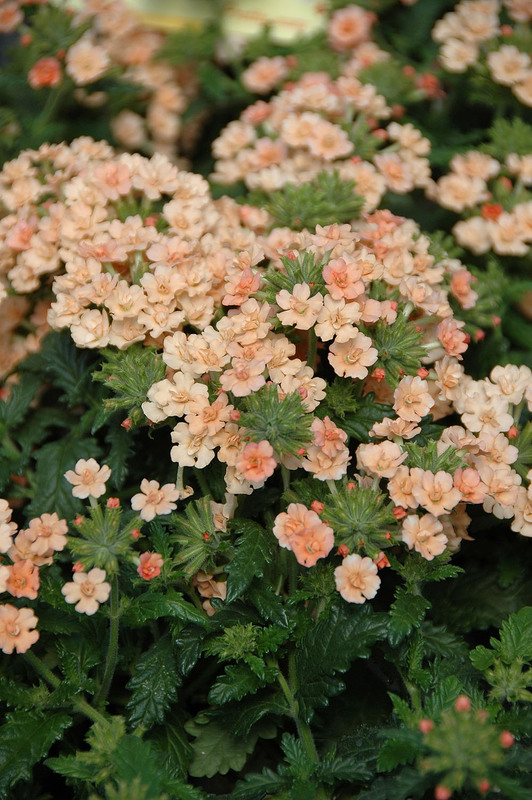 Roccoco and a new variety called Star Dreams are the first double-flowered verbenas on the market. Each small floret of the large blossoms looks almost like a rose. 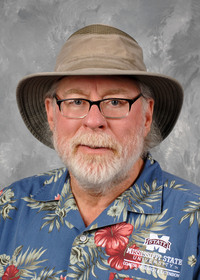 Bicolored varieties include the Tropical Breeze Purple and White and the Lascar Red with Eye, and new colors include Lanai Peach, Aztec Coral and Rapunzel Magenta. To put it simply, there is an extraordinarily beautiful and long-lasting verbena for everyone. 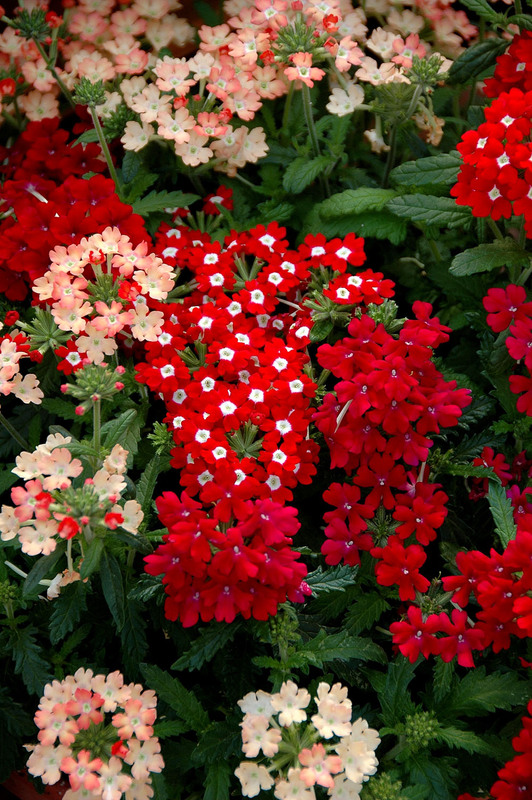 Proper soil preparation and site selection are essential to the verbena's success. Add 3 to 4 inches of organic matter and till it to a depth of 8 to 10 inches. While doing this, spread 2 pounds per 100 square feet of a slow-release fertilizer like a 12-6-6, 8-8-8 or something similar. Provide full sunlight and some water, and you are well on your way to enjoying one of the prettiest groups of flowers available. But there is one other important factor to finding happiness with verbenas. They bloom for weeks and weeks, and then get a little tired. They will still have a few blossoms but will look weak. This is the time to cut them back and side-dress with a little fertilizer so they will send out new growth and produce more blooms. You may need to do this twice in a long growing season, but that is how you have verbena blooms in spring, summer and fall. Despite the winter weather, spring is closer than we think. I am starting to see buds swell on trees and shrubs. When planting season finally gets here, make sure you have room for a few verbenas.